Dreena Burton: she knows what’s up. For years I have been searching for macadamia nuts that do not may contain peanuts, and last weekend my dad found some at Costco!! This is a happy moment; for those of you with food allergies, you get what I am talking about. So, I was finally able to make a recipe that I had on the backlog for months: Dreena Burton’s Vegan Pumpkin Cake and Fluffy Macadamia Mallow Frosting. For her thorough and delicious recipe complete with tips for modifications, go here. Burton is the author of “Let Them Eat Vegan” that is full of delicious vegan recipes for the whole family. I highly recommend it. Here is my experience with the recipe. I made my own macadamia nut butter by soaking the nuts in water and blending them into a butter with a food processor. I had to soak the nuts and rinse them well, as they were salted and roasted. Ideally I would have liked to buy actual macadamia nut butter, or make the butter from raw macadamias, but these things are hard to find peanut-free. I would have also liked to use a Vitamix, but I do not own one. First thing to do is put a can of coconut milk in the fridge overnight, for the frosting. I preheated the oven to 350*F and greased 12 muffin tins (next time I will do 18, as the batter rose more than I expected it to. 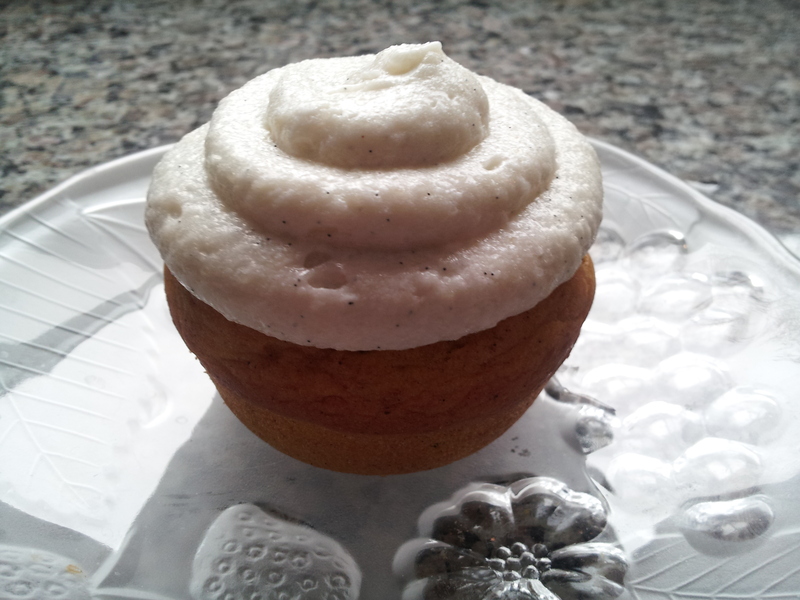 Cupcakes can be smaller because of the frosting on top that makes them larger). In a large bowl I whisked together the dry ingredients. For optimal blending of the batter, they should be sifted, but I was lazy. If you do not sift dry ingredients in recipes, make sure that you whisk it well to ensure the lumps are out, and when incorporating the wet ingredients, ensure that there are not any lumps. In a medium bowl I whisked together the wet ingredients, then added the wet mixture and the oil to the dry ingredients. I used a spatula to incorporate the ingredients together, scraping the bottom of the bowl to ensure everything blended. 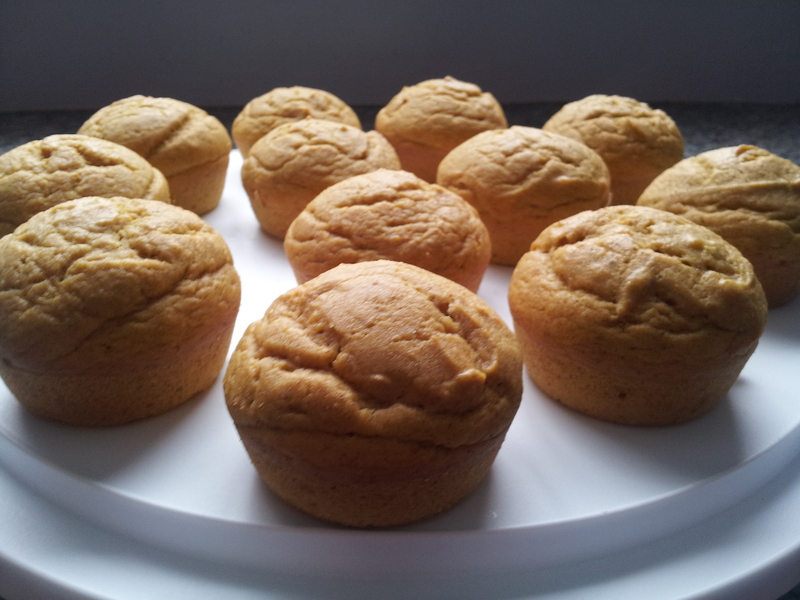 I filled the muffin tins with batter and baked them for 25 minutes, until a toothpick came out clean. This is how long it took for my cupcakes, as the tins were full, but with 18 instead of 12, I think it would take more like 18 minutes. When in doubt, set the timer for less time than you think, and check on them. I let the cupcakes cool completely before frosting them. *note: I used a brand of coconut milk called Arayuma. I got it at the health food store, and it claims to be organic, fair trade, and preservative-free. 1% of the proceeds go to protecting Sri Lanka’s wild elephants. It was the cheapest coconut milk there, and I wanted to try a good-quality coconut milk. I have heard that canned coconut milk is not too good for you, but I am not exactly sure why. Anyway, I just wanted to try something new. *note: cut vanilla bean length-wise and use a knife to scrape out the dark paste inside. You can use 1 tsp vanilla extract if you don’t want to use vanilla bean. To make the frosting, first off, I scooped out the fatty part of the coconut milk, making sure to leave behind all the coconut water. The fat is much more solid than I was expecting, and took up about 2/3 of the can. I placed the coconut fat into a large bowl and whipped it with an electric mixer for about a minute to fluff it up. I added the salt, sugar, vanilla bean, and nut butter and slowly whipped it to incorporate, and added the xanthan gum last. I whipped the frosting for about two minutes until it was creamy. I put it in the fridge to let it solidify a bit more, leaving it in there for about 10 minutes. Using a piping bag, I piped the frosting on the cupcakes. It would have been easy to just use a knife to spread it on the cupcakes, but I felt like they deserved a little more love than that, given how delicious they are. With the leftover coconut water, I plan on making a green smoothie and adding it to that. 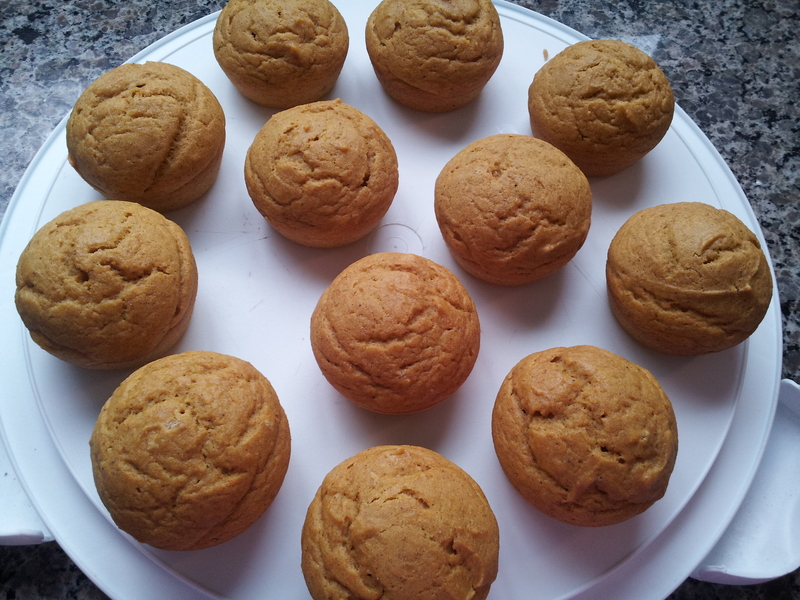 For the leftover pumpkin puree, check out this recipe of mine from a previous post.